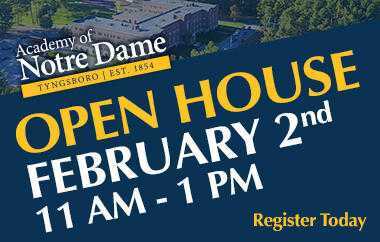 Discover what makes the Academy of Notre Dame different at our Open House event on Saturday, February 2, 2019 from 11 a.m. to 1 p.m. Let our students be your guide and explain the advantages of being NDA Prepared. We welcome families and their prospective students of all grade levels from Pre-K to grade 12. -Find out why your student should be NDA Prepared!